were featured on the Natural Balance's 2012 Rose Parade float. It was worlds longest and Heavest Float! Every year for the last 4 years, Natural Balance Pet Foods has entered a float in the Rose Parade held after the first of the year in Pasadena, California. The theme for this years parade was 'Just Imagine'. In 2009, it was all about a skateboarding Bulldog named Tillman. In 2010 it was all about Snowboarding Dogs with Tillman and his friends. In 2011 it was all about Dock Diving Dogs and Skimboarding Dogs. In 2012 it was all about Surfing Dogs. 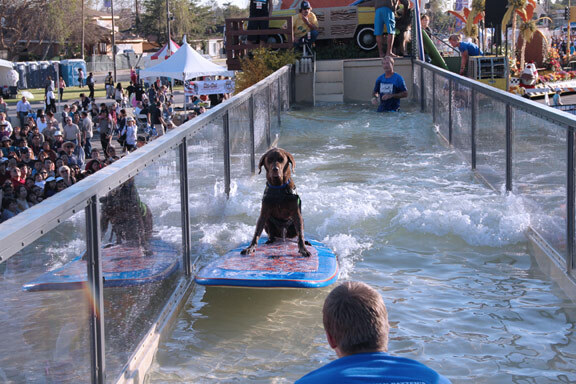 SoCal Surf Dogs Stainley and Newman were featured on the float with Tillman & friends. The Surf's Up float was desiged by Raul Rodriguez and built by 'Fiest Floats' in Irwindale California. World Records for both the World's Longest and World's Heaviest Float! It measured 119 feet 7 inches, and weighed in at 131,950 pounds! The SoCal Surf Dogs were invited up to help decorate the float on December 26, 2012. 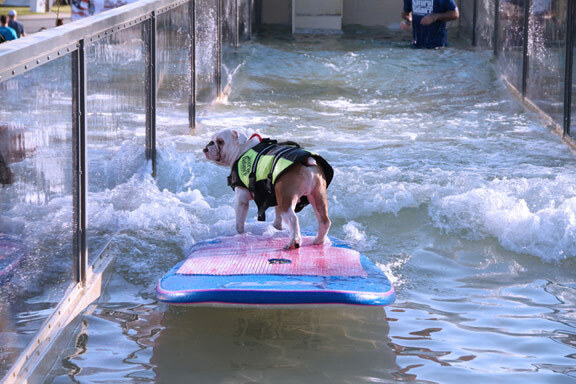 A group of the SoCal Surf Dogs ventured up to Fiesta Floats, in Irwindale California, on December 17th, 2012, to audition for a chance to be one of the few select Surf Dogs to be surfing on the Natural BValance's Rose Parade Float. There were 60 dogs there. and Debbie Matlow's 'Newman' were selected. On January 2, SoCal Surf Dogs members Dina Demeo, Barbara Henderson, Dale Porter and Peter Noll drove up to Pasadena at 3:00 am to watch the Parade. We arrived at 5:30 am an toured all the floats up close before the parade began. Craig Haverstick was kind enough to provide us with tickets for seating in the grandstands where we were able to have a great view of the Parade.